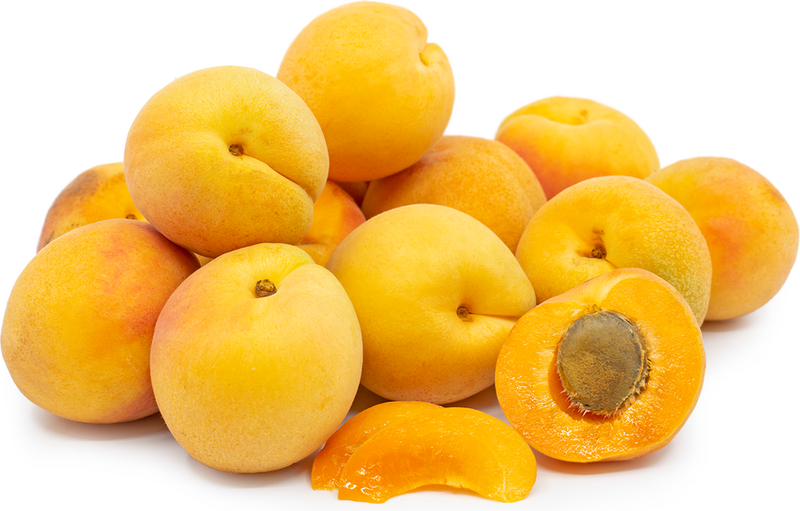 Blenheim apricots are known for its golden yellow and blush red bi-coloring on its outer skin. 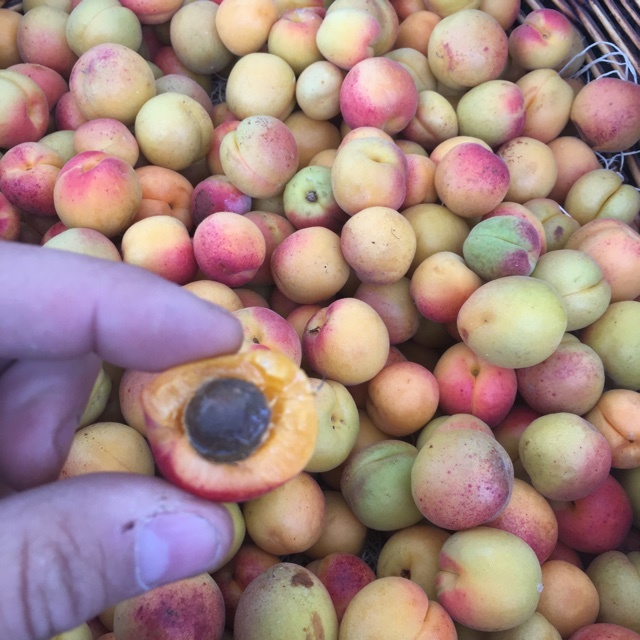 As apricots ripen from the inside out and the Blenheim being a particularly delicate variety, the free stone fruit may have a slight green tinge on the shoulder, yet will still have the full sweet apricot flavor. Blenheims have a thick aromatic flesh with a richer, darker orange color than other varieties. These apricots are known to have a complex yet perfectly balanced sweet-tart flavor with notes of honeysuckle and honey. Blenheim apricots have a short peak harvest period in mid-summer. The Blenheim apricot has become synonymous with the varietal names Royal or Blenheim Royal apricot. The botanical name for the Blenheim apricot is Prunus armeniaca “Blenheim.” As recently as 20 years ago the Blenheim was the leading variety grown in California. However, due to the fruit’s propensity to bruise in shipping, competition from imported dried apricots, and the increased urbanization of the growing areas, the cultivation of Blenheims has drastically decreased. Slow Food USA has listed the Blenheim on their Ark of Taste list of endangered crops. Blenheims are most commonly used for drying and preserves. Fresh Blenheims are also great for eating out of hand, yet are difficult to find due to their delicate nature. Complimentary flavors include vanilla, nutmeg, tropical fruits, citrus, honey, lavender, and ginger. Savory pairings include mild, fresh cheeses such as chevre and ricotta, brie, herbs such as arugula, chilies, cilantro, jalapeno, sweet onions, basil, pistachios, and fennel. When cooked down into jams or preserves pair well with crepes, scones and other pastries. The Blenheim has a tangled genealogy that even dedicated fruit historians have difficulty straightening out. One theory traces it back to a seedling planted in the Luxembourg Gardens of Paris, and introduced to the public around 1815 under the name Royal. Then about 20 years after the introduction of the Royal, a seed, supposedly from the Royal tree, was planted in the garden of the Blenheim Palace. The tree thrived and its fruit was called Shipley’s Blenheim, named after the head gardener of the palace. Blenheims were found planted in the Spanish missions of California by the 1880s and reached their height of cultivation during World War I. During the war shipments of dried fruit from Europe came to a halt and demand for apricot trees in California spiked to supply dried apricots for the market. In the 1920s Blenheim orchards covered Santa Clara and Alameda counties and the Sacramento Valley. 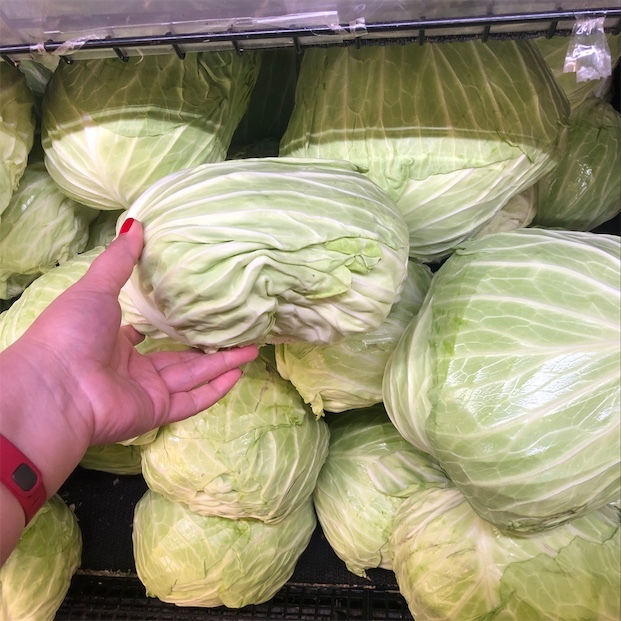 However, this variety’s propensity to bruise and crush during harvest and shipping has caused its decline in the more recent history. Blenheims are best grown in the Northern and central valley of California in the foothills to help avoid late spring frosts that can damage early blossoms. The trees require 400 chilling hours before they produce fruit, full sunlight and fast-draining, loamy soils. Recipes that include Blenheim Apricots. One is easiest, three is harder. People have shared Blenheim Apricots using the Specialty Produce app for iPhone and Android. 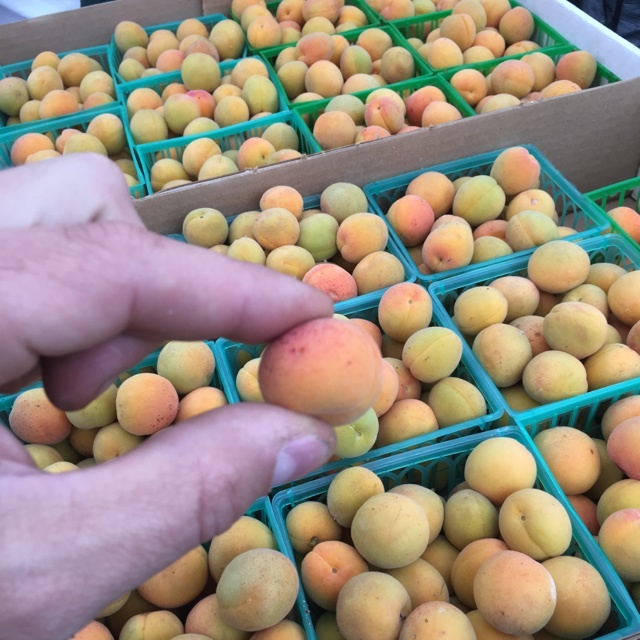 Sharer's comments : Blenheim Apricots spotted at Polestar Farm Esparto CA. Sharer's comments : Blenheim Apricots spotted at Santa Monica Farmers Market. Sharer's comments : Blenheim Apricots spotted at Little Italy Mercato.